Choke, Pinch or Halti? A better way to leash your dog. Despite 15 years as a search and rescue dog handler, I’m not an expert on dogs in general. I’m barely an expert on the one I work. But doing this volunteer work has gotten me in the room with some pretty spectacular dog trainers and I try to soak up what I can. One of the best tips I ever got came from Jean Hampl who runs a school in Gig Harbor, WA. The question always comes up when training basic obedience: Do I use an old fashioned choke collar, a pinch collar, or one of those “gentle leader” types? This ring connects the two shoulder straps with the chest strap. Clip into it instead of the usual spot on the dog’s back. connecting to the usual spot on the dog’s back. 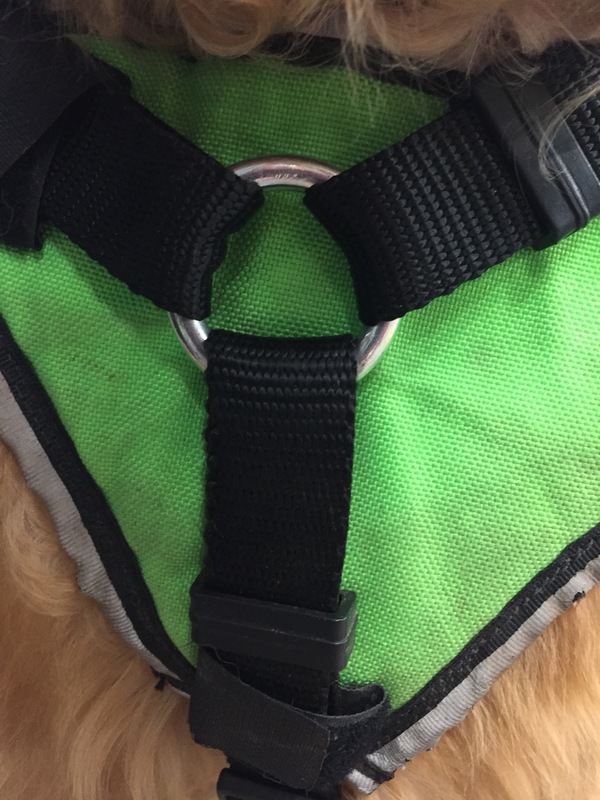 Good harnesses will have a metal ring connecting the two shoulder straps with one that comes up from the chest. It’s not meant to have a leash clipped to it, but it works great. 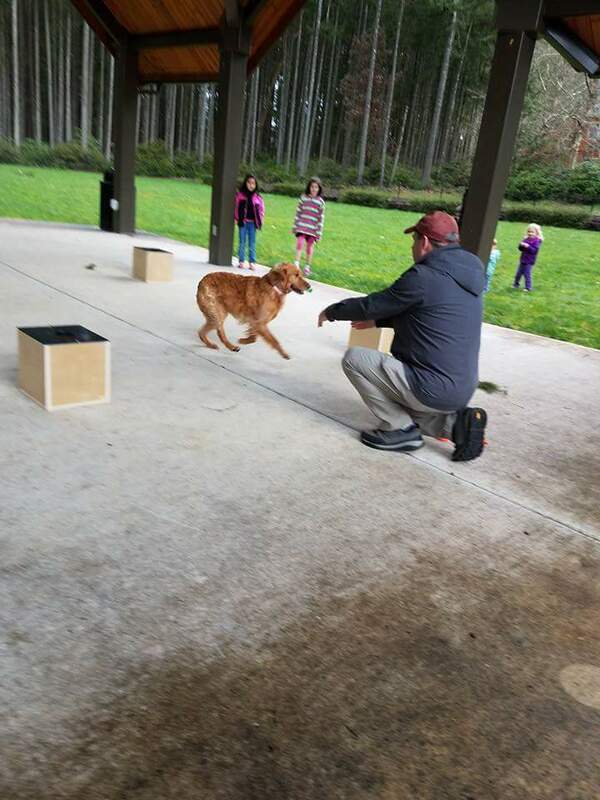 Here’s why: When the dog inevitably takes off running out in front of you, the connection at the chest pulls the dog to the side. There’s no choking, no pinching, and no yanking of the head on those supposedly “gentle” leaders. If you clip to the usual spot on a dog’s harness, you’re pitting the dog’s strength against yours. After time, you’ll tire and lose. Think Iditarod. A leash correctly clipped to the front ring of Ruger’s harness. Because the dog gets pulled to the side, it has less strength to fight the correction. Its body isn’t built to pull hard in that direction. 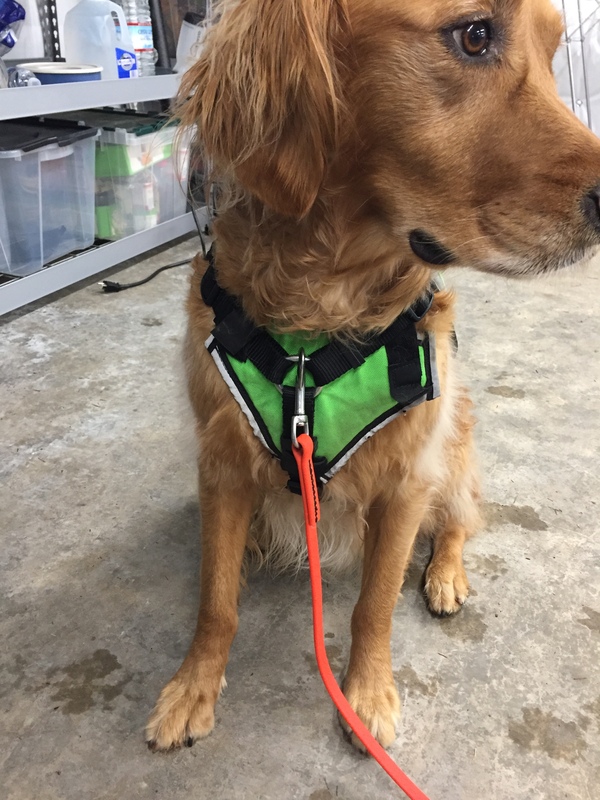 And when you’re ready to let the dog play around and be a goofball, then go ahead and connect to the regular spot on the back of the harness. Then the dog will know it’s OK to pull in search of that wonderful smelling fire hydrant. Jean’s Facebook page is https://www.facebook.com/Hampls-Dog-Obedience-141987085827318/. All credit to her for this tip. If you enjoyed this post you can sign up to be notified of future posts. And be sure to like Sierra’s Facebook page at http://www.facebook.com/sierrasearchdog.